VISTA Variables in the Via Lactea (VVV) is one of the six ESO Public Surveys selected to operate with the new 4-meter VISTA Telescope. VVV is scanning the Milky Way bulge and an adjacent section of the midplane, where star formation activity is high. The survey will take 1929 hours of observations during five years (2010–2014), covering ~109 point sources across an area of 520 deg2, including 33 known globular and ~420 open clusters. During the Third VVV Meeting we will discuss the results of the first two years of the VVV Survey as well as to plan the strategies for the next years. The Meeting is being planned to include contributed talks, poster sessions and plenary discussions. 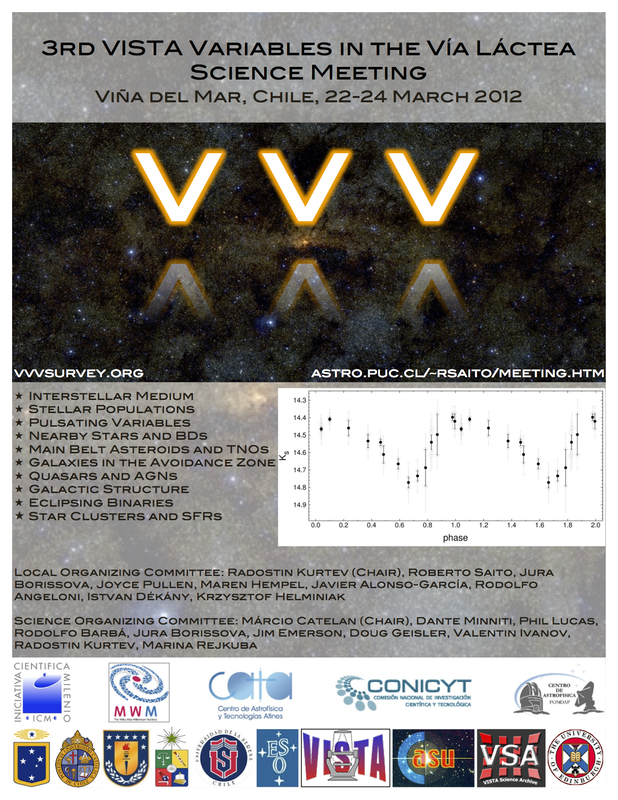 Registration for all participants must be made directly by email to rsaito@astro.puc.cl. Please include your First and Last Name, Institution, Country and in the case you are planning to contribute with a talk or poster, please send us an informative title. The registration is now closed. Deadline: Since the Chilean universities are officially in vacations during February, we are extending the deadline for registration to March 4. Financial support: We are able to provide financial support covering two nights at Hotel San Martin (double room, check-in/-out on Thursday/Saturday) for a limited number of students and participants presenting talks/posters. In any case you must proceed with the hotel reservation according with the instructions present below. The International Airport of Santiago (code SCL), officially called Arturo Merino Benitez, is located on the outskirts of Santiago. Public transport is available between the airport and downtown Santiago, with options including buses, minibuses and taxis. We highly recommend using the official transport offered by Santiago airport. Further information can be found at http://www.aeropuertosantiago.cl/. Those who wish to travel directly from the airport to Vina del Mar can take a bus (details at the link above) or taxi to Estacion Pajaritos, from there you can catch a bus to Vina del Mar. Alternatively, if you arrive on a LAN flight it is possible to book a direct transfer from the airport to Vina. This journey must be booked in advance with LAN and is apparently not available to passengers arriving on other airlines (http://www.lan.com/asociados/informacion/datos_uso_diario/buses_vina.html). Vina del Mar is a Chilean commune and coastal city in Valparaiso Province, 120km from Santiago. Vina is also known as La Ciudad Jardin (“The Garden City”) for displaying big green areas. It has precious beaches, with long avenues that limit with the ocean. During March the average temperature in Vina del Mar ranges from 12C (54F) to 21C (70F) with little rain, ~2 mm/month. A regular bus service connects Vina to Santiago every 10-20min during the day. (see turbus or pullman bus).